… and ten five mouth-watering pictures! It is not exactly on the tourist trail; so how did we find this delectable place? Seeking somewhere to dance, we were driven by a family member to an Ipoh ‘nightclub’. On entering, it was so dark that we needed a guide dog! Furthermore, the booming ‘doof-doof’ of the music was so loud – please read deafening - that we could only last for two painful minutes. A quick call was made to our ‘driver’ and he returned to collect us. This time, he took us to the Excelsior Hotel where we discovered music more to our liking. Much more to our liking. Downstairs, a talented Filipino band, Sensation, was playing music from many cultures: Anglo, Latino, Malay, Chinese, Tagalog, Hindi… Similarly, upstairs, another wonderful and accommodating local band, Cheeky Cheeky Boom Boom, were belting out requests for a small, very appreciative audience. The ‘multicultural’ mix of music was something new, but very satisfying and enjoyable, for us. After such exertion, one needs food, of course. A recharge. In Australia, we have to ‘recharge’ at home after a night-out dancing. But what about Ipoh, Malaysia? So, following our noses home, we drove up the hill and took a right turn from the Excelsior Hotel. 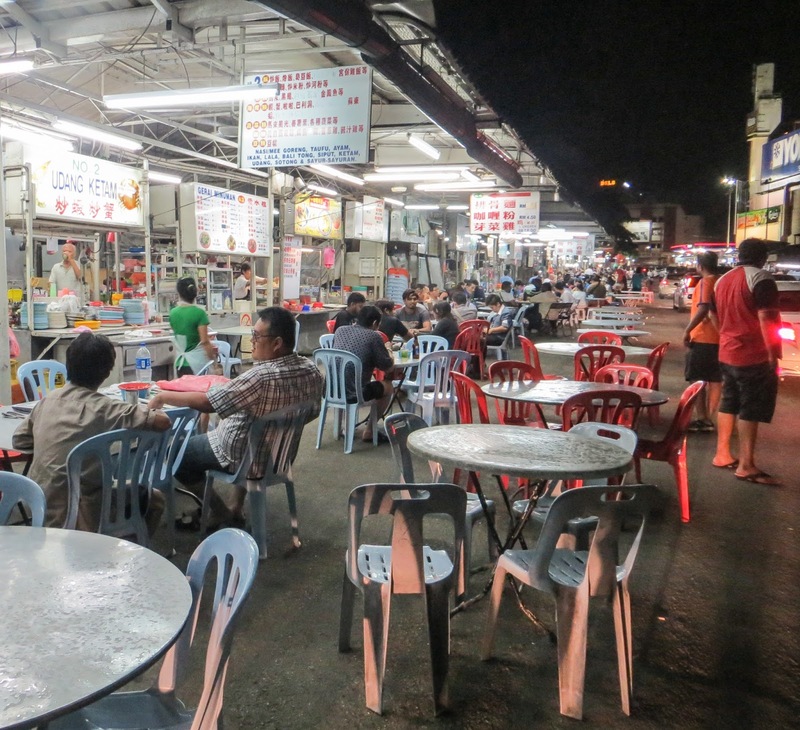 There it was, directly in front of us, an alley of brightly lit food stalls, vibrant with late night customers. It was one o'clock: this would never happen in Australia! I drove across the four-lane main road and entered the alley against the traffic flow… it being a one-way street! I can imagine what thoughts the locals were having when I stepped out of the driver’s side of the car. Nevertheless, I had found a place to park. So, here we were. We walked up and down the lane of stalls, many of which simply served iced desserts. How refreshing after hours of dancing in Malaysian heat! Where to start? I was like a kid in a lolly shop! We started with the known and selected Ais Kachang… it was the best! We had been served it in other parts of Malaysia, but this was the best yet! Scrumptious! And there on another table I spotted the icy piece-de-resistance... the Ais Champur. Being an incurable 'fruitbat', that decided it for me. Mango, jackfruit, watermelon, dragonfruit, longan, peanuts... and everything else you would expect in a good Ais Kachang. With a scoop of ice cream too! I need to stop drooling. "Honey, we are coming back here!" From that moment, we determined that we would try the desserts from the other food stalls of that lane on subsequent nights. 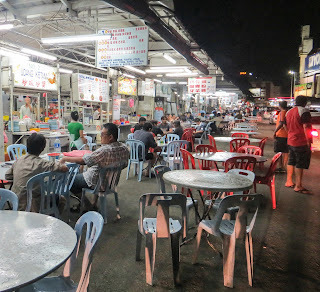 That we have done, the fruit-bat raiding the many gerai manisan (sweets stalls) at every night-time opportunity: even when the fruit-bat's other half tired of the iced sweets, there were some splendid noodle dishes to sample. The years passed. Every year we would return to Ipoh. Every visit, we would religiously go dancing at the Excelsior. Sadly, the Filipino bands are no longer hired by the hotel and Cheeky Cheeky Boom Boom have been playing at a new location for some time. However, we always return to this wonderful food alley when we are in town. … and we still have not yet discovered better iced desserts anywhere in Malaysia! … and I now know how to drive into Tong Sui Kai from the correct direction!